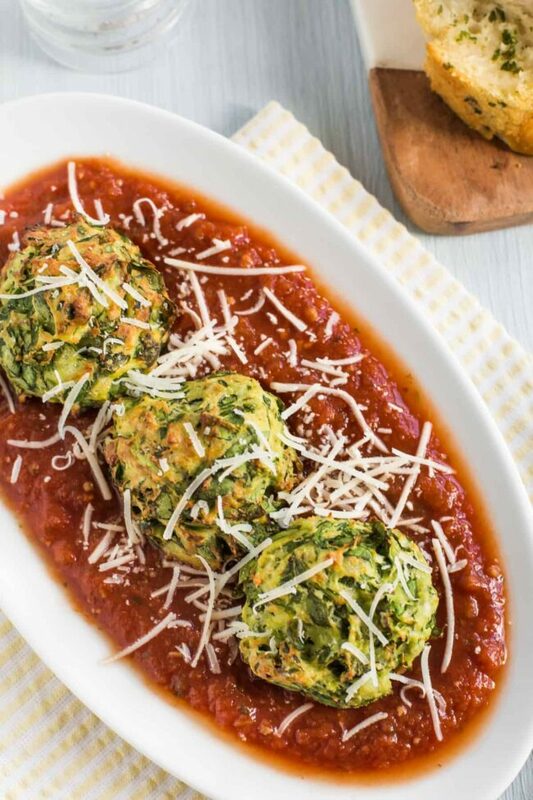 These spinach and ricotta dumplings are super easy to make, and can be served either as an elegant vegetarian dish for guests, or as a hearty weeknight dinner! 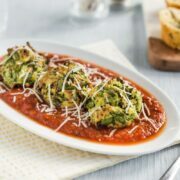 It’s not often I share a super elegant dish like these spinach and ricotta dumplings, and you could be forgiven for thinking they’re only suitable for fancy dinner parties with guests who you want to impress. But before you click away, thinking you’re nowhere near posh enough for a recipe like this, let me reassure you – these dumplings are super easy to make, and if you don’t want to plate them up beautifully, they’re just as good eaten from a bowl in front of the telly (which, if I’m honest, is how I eat 90% of my meals). I don’t discriminate when it comes to dumplings – I love all kinds. Chickpea dumplings, suet dumplings, potato dumplings… if you’re a dumpling, you’re welcome in my house (/belly). 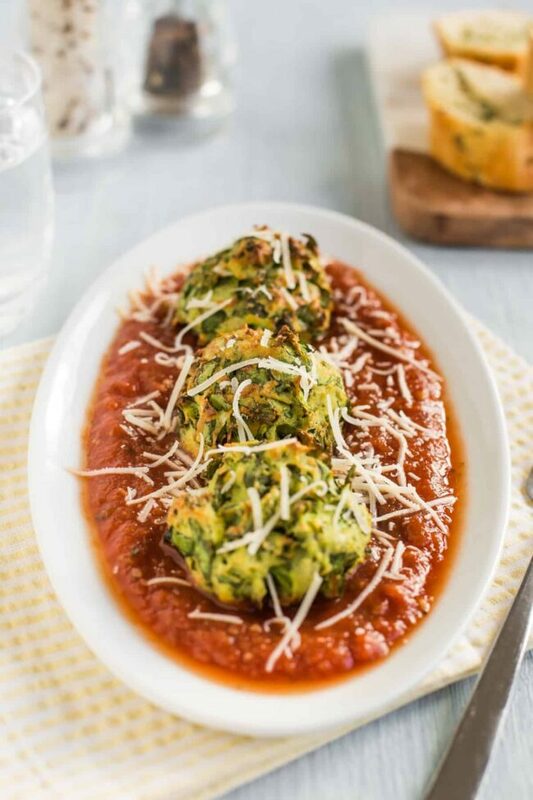 These spinach and ricotta dumplings are lighter than a lot of the dumplings I’ve made previously – the recipe is based around the ricotta cheese, so they’re nice and fluffy. I love a bit of stodge as much as the next person (or probably a bit more? ), but it’s nice to make something a bit more delicate sometimes too. Plus, they’re really easy to make! 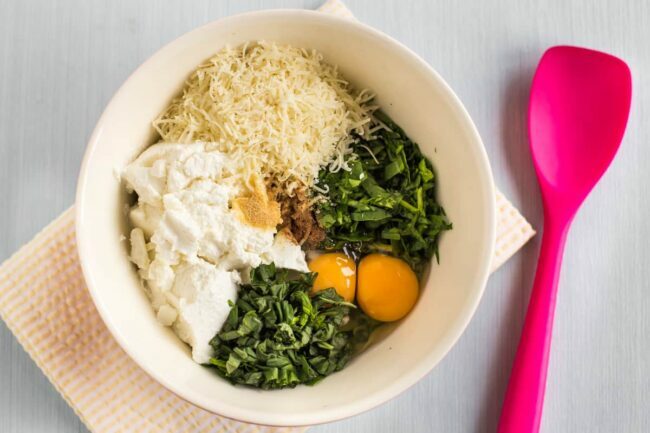 To make the dumpling mixture, just mix plenty of fresh spinach together with a tub of ricotta cheese, a couple of eggs, and some grated parmesan-style cheese. I also added some herbs and spices for extra flavour. When I’ve made this recipe in the past, I cooked the spinach beforehand, then squeezed out the liquid. 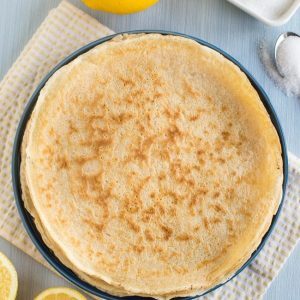 But since I’m always looking for ways to make my recipes quicker and simpler, I thought I’d try skipping this step, and they still worked just fine! 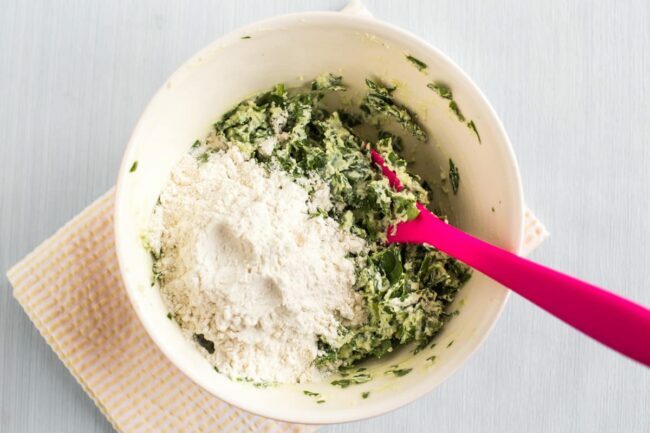 So you can use raw spinach to save time – just make sure you chop it nice and finely. When you’ve mixed everything together thoroughly, add a few spoonfuls of flour – and that’s your dumpling mixture done! These spinach and ricotta dumplings are baked, so the actual cooking part is entirely hands-off. Just roll the mixture into balls, and pop it on a baking tray. I made 15 dumplings from this recipe, but obviously the exact number will depend on how big or small you make your balls. The recipe will serve around 4 people, so it probably would have been better if I’d eked it out to make 16! Just stick them in the oven until they’re nice and golden. 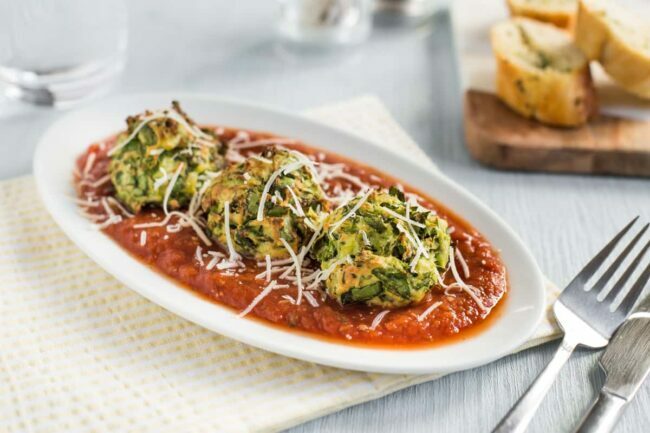 These spinach and ricotta dumplings are perfect served with a rich tomato sauce. You guessed it, I used the slow cooker tomato sauce that I showed you how to make last time. 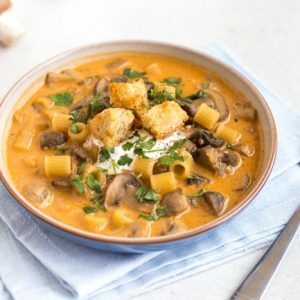 It’s perfect for this recipe – you can make it in advance, so when your dumplings are ready, you can just heat up however many portions of sauce you need, and you’re good to go. I nestled my dumplings beautifully in a layer of sauce, but they’d be equally good stirred through the sauce, or with the sauce poured all over them. Depends how fancy you’re feeling. Don’t forget a bit of extra grated cheese on top, just because. 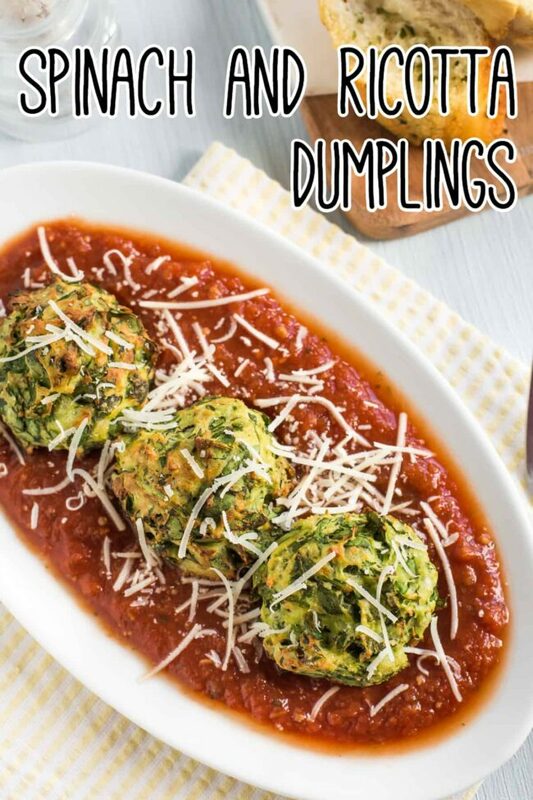 How else could I serve these spinach and ricotta dumplings? As far as dumplings go, these ones are relatively low-carb. They do contain a bit of flour, so they’re not entirely carb-free, but compared to the super stodgy dumplings I usually make, these are definitely lighter. That said, they’re amazing served with some carbs on the side (I would be the worst low-carb dieter ever). You could serve them like meatballs with a plateful of spaghetti. Have a few slices of garlic bread on the side for mopping up the tomato sauce. Or even go the whole hog and serve them in a buttery roll like a meatball sub. I will only judge you positively. 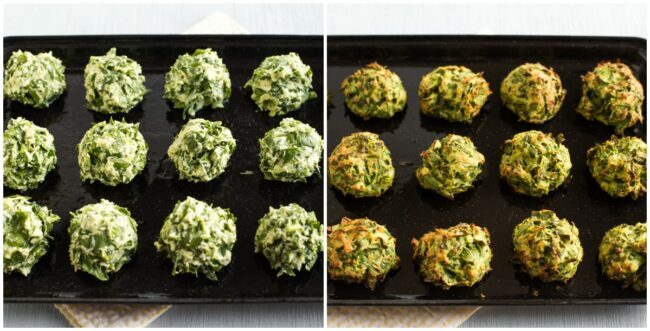 How will you serve your spinach and ricotta dumplings? Chop the spinach finely, and add it to a large mixing bowl. Add all the remaining dumpling ingredients except for the flour, and mix well. Add the flour, and mix to combine. Lightly grease a lined baking tray, and use clean hands to shape the dumpling mixture into balls. I made 15 balls, but the exact number will depend on exactly how big you make them (if you make far more or far fewer balls, you may need to adjust the cooking time – smaller dumplings will cook more quickly). Spray the dumplings with a little oil, and bake at 180°C (Gas Mark 4 / 350°F) for around 25 minutes, or until the dumplings are golden brown. 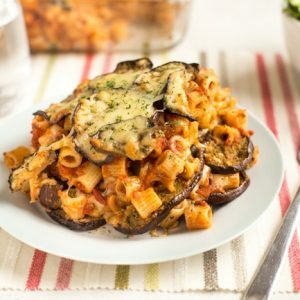 Serve with your favourite tomato sauce, and a little more grated cheese if desired. Note: Nutritional information is approximate, and will depend on exactly what ingredients you choose. Information above is for 1/4 of the recipe, dumplings only. 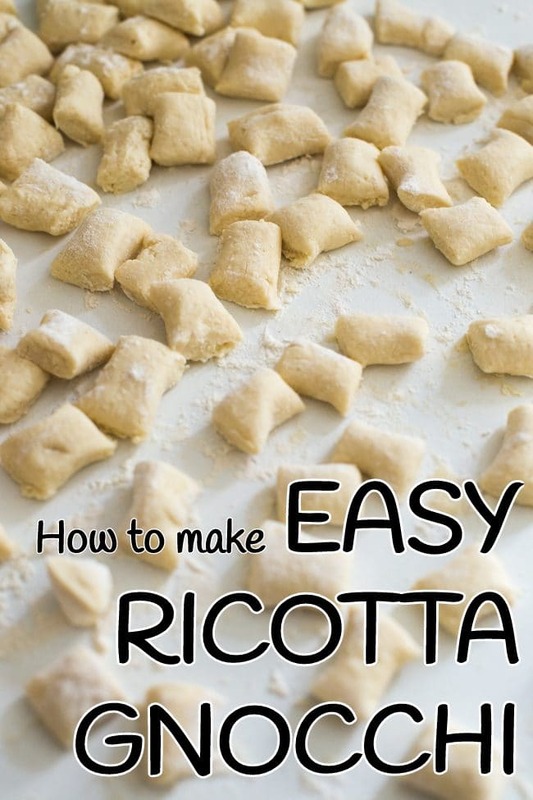 If you love fluffy dumplings, you must also try homemade ricotta gnocchi! It’s quick and easy to make, and the dumplings are so light. 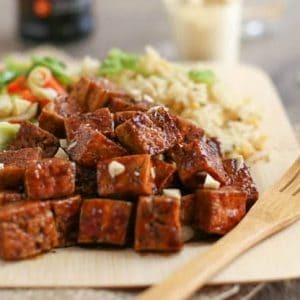 These look amazing, and pretty easy, a must for me when I cook! I will be trying this recipe in the very near future. Also wondering about the frozen versus fresh spinach? I always have some in the freezer and would be easier for me. 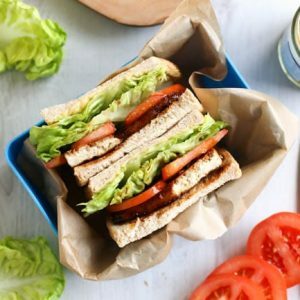 Thanks so much for your lovely recipes! So excuse my ignorance if this is a very dumb question! 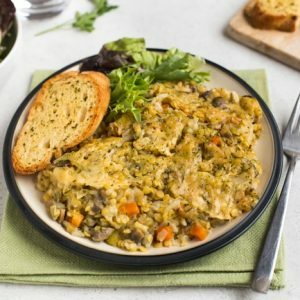 Would frozen spinach work in this or would it be a big no no? Big bag in the freezer but can go buy fresh if would be huge difference in taste. hello…i just wonder why people do NOT have the print option on their sites. itis most annoying. have to forward it and or jiggle the printing stuff…it would be nice if i could just click on the printer and then print! Although marinara sauce is a nice accompaniment, don’t limit yourself! Try a drizzle of roasted garlic infused olive oil or sage butter sauce. So delicious and very good for you. You’re absolutely right and the red contrast is beautiful. 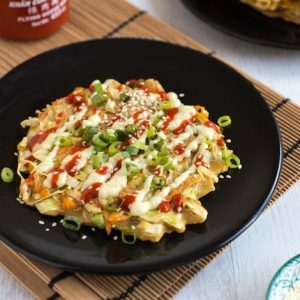 I’ve made these dumplings many times and have topped them in a variety of ways. If you’ve ever heard of sauce belle aurore, that is the best for these dumplings or other filled pastas like tortellini. This looks delicious!!! I am posting this on my healthy lifestyle blog, sipnibbleandnosh.com . This is just the type of small meal or tappas I love while reading a great book or writing for my blog!!!! I can almost taste and smell it!!! They do look wonderful Becca! I totally believe you when you say these are the best things ever! That’s pretty much what I thought when the page first loaded, haha :) I’m going to throw in some fresh basil, too- can’t wait! These look and sound delicious. I want to be pretentious and call them clouds. I’ll make sure to wear a faux-pearl necklace when I make them xD.